For the past two days, I've been listening to Dan Carlin's conversation with Sam Harris. This morning, I heard an exchange around the Confederate Flag that caught my attention. First, Dan floated the thought of a redesigned Confederate flag, to show regional pride without showing racism. I would love to interview these folks, because whenever someone writes me a letter about this, they always say "It's not about the slaves and it's not about the racial situation, it's about the right to seceede, to protect your life, it's a right to do all ...", in other words, take every reason for the civil war besides the slavery aspect and they will say it's about that because nobody's, or very few people I've ever spoken to, say "Yeah, I fly the flag because black people are inferior and blah, blah, blah." I would love to see a notation then to the flag, you know there's a lot of flags from other countries where something will happen and a new regime will take over or something will change and they'll alter the flag slightly, you know we'll always put another star on our flag when a new state came in. Seems to me you could put something like a chain being snapped or something in the center of the flag or something that indicated that this flag isn't in favor of slavery or this is the post-slavery Confederacy or "Welcome back black people to the New South", whatever. Something that just sort of said, "You know the little chain on the flag being freed, yeah, that shows that this flag does not represent something that said that the slavery was the part that we would like to see returned." A few minutes later, Dan came back to that thought and expanded on it a bit more. In the emails that I'll get about this people will talk about "It's just a pride in your heritage sort of thing". I think the pity then is that there isn't an alternative symbol that if you wanted to say "I'm a Southerner and I'm proud of it" that you could show that didn't have the same overtones, that didn't appear to some people that you're not just saying "Yes, I'm proud of the South but I'm proud of things the South did before the Civil War". I mean the United States for example has a whole bunch of other flags that we've flown at one time or another, the Gadsen Flag, all those kinds of things, which different people can appropriate to show different aspects or different ideas. Seems to me, if you're into Southern pride—and I don't think there's anything wrong with having pride in your heritage, or your grandfathers, or anything like that. It's a pity that the symbol you could use to show that has all sorts of other overtones that are not just deeply offensive but that make people who are valued members of your community feel, not just like second class citizens, but maybe even a little afraid. Who would want to show that in a way that took other Southerners and, instead of making them feel proud, would make them feel the opposite of proud? I decided to take that idea and run with. What if I took the Confederate flag and changed the colors? 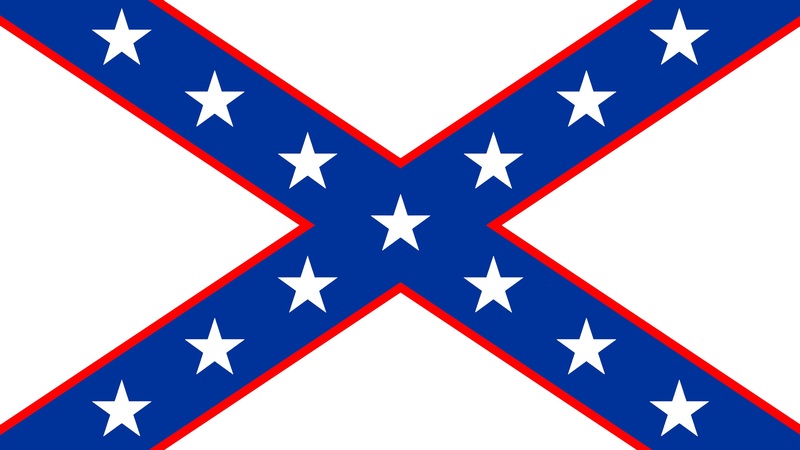 I decided to keep the basic elements, to represent some continuity of Southern culture, but change the colors to signify that this is a New South that doesn't embed the racism and hate of the past. I think the defining features of the original flag are the bold, red field that dominates the flag and the two blue bars that crisscross the field. That's what I need to change, to make this feel like an updated, more modern, version of the flag. For my first attempt, I wanted to deemphasize the red. I moved the blue from the bars to the field and moved the red from the field to the stars and the outline of the bars. I didn't like how bright (eye searing?) the red and white bars were. I decided to make the field white and match blue bars with white stars. I deemphasized the red even more, relegating it to the outline of the bars. The second attempt was better than the first, but I didn't like the bright expanse of white, now that the entire field was white. I made the field blue again and decided to get rid of the red entirely, replacing it with green. Now the stars are green and the outline of the bars is green. I'll say that the green is there because it can represent the rebirth of the South into the new South. This is nearly identical to the third redesign. 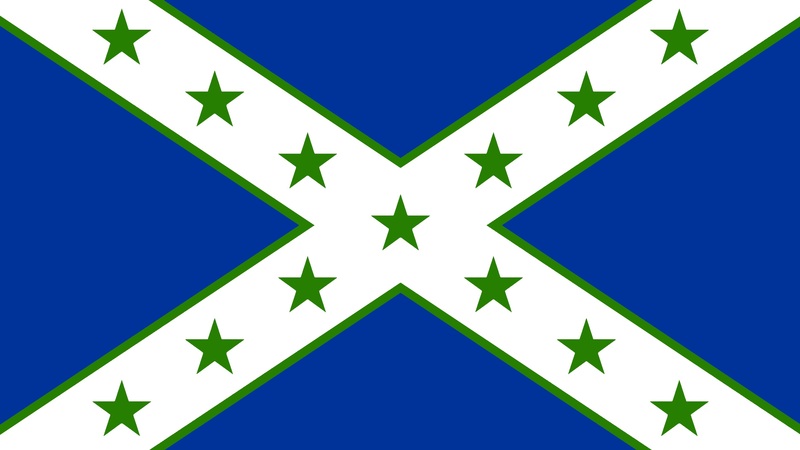 In this one, I removed the outline of the bars, to make for a starker contrast against the blue field and a further distancing from the Old South design. What do you think? 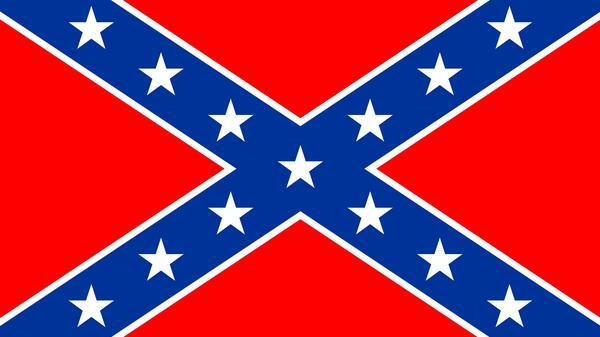 Can you imagine seeing one of these flags as a common symbol of the New South, one not associated with racism and hate? The biggest problem in healthcare is that providers—doctors and hospitals—are allergic to straightforward pricing and refuse to give actual prices before providing services. This idea for a solution isn't perfect but I think it's worth trying. For these reasons and others, last week I joined my colleague Sen. Patrick Leahy, Vermont Democrat, in introducing a bill that would authorize judges to disregard federal mandatory-minimum sentencing on a case-by-case basis. Some might think it is unusual for a conservative Republican to join a liberal Democrat on such a bill, but contrary to popular belief, the protection of civil liberties and adherence to the Constitution should be a bipartisan effort. In my younger days, I would have regarded this as rank liberalism and heresy. Now it just seems like common sense. I'll stand with Rand on this one. Read the whole thing. His reasons are dead on. Why? A more progressive tax code now leverages the negative impact of slow economic growth. The share of all individual income taxes paid by the top 1% has risen to 41.8% in 2008 from 17.4% in 1980—but almost two-thirds of the income from the top 1% comes from nonwage income, including capital gains, dividends and proprietor's profits. Individual income taxes as well as corporate taxes are now far more rooted in the shifting sands of volatile business income and capital profits rather than in the terra firma of wage income that stabilizes payroll taxes. From 1960 to 2000, payroll taxes were never lower than in the previous year, individual income taxes dipped only twice, and corporate taxes dropped 11 times. Since 2000, individual income and corporate tax revenues dropped five times, while payroll taxes fell twice. Not only do revenues from individual tax returns drop more often now. They fall more severely, with recent collapses of 14%-20% versus the 3%-5% range before 2000. If "the rich" pay all of the taxes (and they pay a massive share in the U.S.) than tax revenues will be directly tied to the fates of the rich. Right now, the federal government needs high income earners to continue earning high incomes. As soon as the high incomes take a hit, tax revenue takes a massive hit. We now have a government that has a massive incentive to ensure that "the rich" never see their incomes drop. We might have a more just government if we evened out the tax code, so that income taxes were spread more broadly and more evenly over the entire country instead of being concentrated over a very small portion of the country. During Jeb Hensarling's first congressional bid, a man at a campaign stop in Athens, Texas, asked the Republican if he was "pro-business." "No," the candidate replied, drawing curious stares from local business leaders who had gathered to hear him speak, a former Hensarling aide recalled. "I'm not pro-business. I'm pro-free enterprise." Now, more than a decade later, that distinction has Wall Street on edge. The new chairman of the House financial services committee wants to limit taxpayers' exposure to banking, insurance and mortgage lending by unwinding government control of institutions and programs the private sector depends on, from mortgage giants Fannie Mae and Freddie Mac to flood insurance. Banks and other large financial institutions are particularly concerned because Mr. Hensarling plans to push legislation that could require them to hold significantly more capital and establish new barriers between their federally insured deposits and other activities, including trading and investment banking. A Republican who wants to make banks play by the same rules as the rest of a us? A Republican who wants to lets bad businesses fail? A Republican who believes it's a profit and loss system not just a profit system? Okay, I can buy that. But how'd he get to be chair of the House financial services committee? That seems too good to be true. I'll have to keep an eye on Congressman Hensarling. Despite the passage in late 2012 of a new state ballot initiative that prevents California from ever again giving out life sentences to anyone whose "third strike" is not a serious crime, thousands of people – the overwhelming majority of them poor and nonwhite – remain imprisoned for a variety of offenses so absurd that any list of the unluckiest offenders reads like a macabre joke, a surrealistic comedy routine. Have you heard the one about the guy who got life for stealing a slice of pizza? Or the guy who went away forever for lifting a pair of baby shoes? Or the one who got 50 to life for helping himself to five children's videotapes from Kmart? How about the guy who got life for possessing 0.14 grams of meth? That last offender was a criminal mastermind by Three Strikes standards, as many others have been sentenced to life for holding even smaller amounts of drugs, including one poor sap who got the max for 0.09 grams of black-tar heroin. Justice should be blind but it shouldn't be deaf, dumb, and stupid too. Shame on the politicians who passed these laws and more shame on the voters who supported them. I was one. As a kid, I thought Three Strikes and mandatory sentencing guidelines were a great idea to crack down on soft judges. I was wrong. These laws are wrong. And the people unjustly imprisoned for long sentences deserve release, apology, and restitution. Huelskamp and his Republican colleagues changed all that. The 2011 Budget Control Act cut spending by $1.5 trillion, and the sequester cut it by an additional $1.2 trillion. At the same time, House Republicans were able to preserve nearly all of the expiring Bush tax cuts and cut the debt. The CBO's Budget and Economic Outlook for fiscal years 2013 through 2023 shows just how much House Republicans have actually accomplished. The federal government is now on track to spend just $46.2 trillion through 2021. That is a $3.6 trillion spending cut. And instead of taxes eating up 21 percent of the U.S. economy in 2021, now the government is set to take in just 18.9 percent. The 2021 national debt is projected to be a bit lower, too, down from the earlier $18.25 trillion in 2011 to just $17.87 trillion today. Despite all of this supposedly economy-killing "austerity," unemployment has steadily fallen, too. When Republicans took control of the House in 2011, the nation's unemployment rate was 9 percent. Today, it has fallen to 7.7 percent. This is why I'm not entirely pessimistic about working in politics. Change is slow and hard. But that's a feature of the system, not a bug. If the American populace wants to get engaged and fight battles over the long term, they will be able to have success. The key is not just getting engaged but also staying engaged over a long period of time. Alex Tabarrok, of George Mason University, shares an interesting account of regulation, deregulation, and increased safety. In the mid-90's, Piper, Cessna, and Beach were no longer producing small airplanes for the general public. They were too afraid of lawsuits over planes that were decades old. Congress eventually responded by saying that "manufacturers could not be held liable for accidents involving aircraft more than 18 years old". The result: an increase in overall safety. a significant (on the order of 13.6 percent) reduction in the probability of an accident. The evidence suggests that modest decreases in the amount and nature of flying were largely responsible. After GARA, for example, aircraft owners and pilots retired older aircraft, took fewer night flights, and invested more in a variety of safety procedures and precautions, such as wearing seat belts and filing flight plans. Minor and major accidents not involving mechanical failure—those more likely to be under the control of the pilot—declined notably. When it cames to safety regulation, more is not always better. Sometimes it's just more. People are more likely to be cautious if they believe that they bear risk themselves rather than believing that someone else bears all of the risk. Wisconsin's School Choice Demonstration Project (SCDP) recently finished a 5-year study of the effectiveness of Milwaukee's voucher program. Wide variation in achievement levels between schools. So what are the practical lessons from the SCDP for other communities considering vouchers? Don’t expect the introduction of a voucher program to sizably increase test scores across the board for voucher users, or students in public schools. It’s safe to expect no negative impact on test scores, but any gains will likely be substantively small. So if the primary consideration in a community is raising test scores, a voucher program like Milwaukee’s may not be wise. However, if you are a community struggling with high school graduation rates, particularly for low-income pupils (like Madison and Green Bay), a Milwaukee style voucher program could be a viable strategy to raise attainment. I think this evidence justifies expanding the voucher program state wide. I'd love to see that happen. I was ecstatic when I read this yesterday. the Republican Study Committee expresses support for expanding fair use, treating the reduction of statutory copyright damages as a kind of tort reform, punishing false copyright enforcement claims, and limiting copyright terms to twelve years, with increasingly expensive extensions available for no more than 34 years. It is the most radical proposal for overhauling copyright that we have seen in recent years — and the most head-turning change of direction in decades for either party on intellectual property issues. This would have been a major step forward for the Republican party in two crucial areas. First, it's an issue that is important to many younger voters, a demographic that has little affection for Republicans. Second, it would have demonstrated that the Republican party is something other than a reflexive protector of big businesses. Sadly, the Republican Study Committee withdrew their brief within 24 hours. Yes, the Republican Party has just caved to a major big business (Disney) representing a major industry (Hollywood) that hates Republicans. In the process, angering many younger voters and technology savvy voters. How, exactly, do the idiots running the party think that this will help them out? This only proves, again, that the Republican party protects big businesses no matter and cares nothing for other Americans. Worse, our cultural heritage is rapidly disappearing. Virtually the entire cultural output of the 20th and 21st centuries—movies, music, art, literature—is locked up in restrictive copyright. All of these works will be lot forever, unless the copyright owner sees a clear, commercial benefit to keeping these works available. Copyright reform—and limiting the term of copyright—is a vital part of preserving our cultural heritage. From a political, cultural, and policy standpoint, this is an absolutely stupid decision. I'm furious with the Republican Study Committee and the craven cowardice that they've spinelessly demonstrated. The Tax Foundation runs the numbers on Romney's tax plan. The debate over Mitt Romney’s tax plan has largely revolved around the short term concerns of who gets what and how much, rather than the more long term concerns of economic growth, job creation, deficit reduction, and tax reform. This is unfortunate, especially in a time of record unemployment and debt levels. These serious issues have been put aside to focus particularly on the results of a single study by the Tax Policy Center (TPC), which finds Romney’s tax plan would require raising taxes on low- and middle-income earners to pay for tax cuts for high-income earners. However, to get there, TPC assumes that tax rates do not matter for economic growth, i.e., Romney’s plan to cut income tax rates by 20 percent across the board will have no effect on labor supply or saving and investment decisions. Only among Washington score keepers does such an assumption make sense, but it certainly has no credibility among academic economists. So, what will be the effect of Romney's tax plan? The results are considerably different from TPC’s. We find that fully 60 percent of the static revenue loss from Romney’s plan is recovered when the dynamic effects of economic growth are taken into account. We find that while the cuts in the individual income tax rates do not “pay for themselves,” they do grow the economy 1.8 percent over the long run. The biggest boost to the economy comes from the 10 point cut in the corporate rate, which grows GDP by 2.3 percent, the capital stock by 6.3 percent, and the wage rate by 1.9 percent. The corporate rate cut is so economically beneficial that it does pay for itself, when all federal revenue effects are considered. So does the elimination of taxes on capital gains and dividends for middle-income earners and the estate tax. These benefits are widely shared. Every income group experiences at least a 7 percent increase in after-tax income. That's reform I can get behind. October 11, 2012 09:43 AM CDT How much would it matter if we deregulated health insurance across state lines? A new paper from Georgetown University researchers suggests a third possible outcome: Absolutely nothing at all will happen. They looked at the three states – Maine, Georgia and Wyoming – that have passed laws allowing insurers from other states to participate in their markets. All have done so within the past two years. So far, none of the three have seen out-of-state carriers come into their market or express interest in doing so. It seems to have nothing to do with state benefit mandates, and everything to do with the big challenge of setting up a network of providers that new subscribers could see. Interesting. This is another argument in favor of spending out of pocket instead of purchasing healthcare through health insurance. You can negotiate and shop around immediately. You don't have to wait for an insurance company to set up a network and then pay them. Romney's tax plan is revenue neutral because he lowers rates while simultaneously eliminating exemptions, deductions, and other "giveaways to special interests". It's what I really want out of tax reform and it's one of the things that makes me look forward to a Romney administration. Alex Brill, of the American Enterprise Institute, breaks down how the Romney plan would work and why the math, contra the Brookings Institute, doesn't point to a tax hike. Romney has proposed a bold tax reform that would broaden the tax base and lower statutory tax rates across the board. While maintaining preferential rates for savings and investment, his proposal repeals the tax expenditures that distort economic decisions and add complexity to tax returns. Although Obama has no such plan for tax reform, his vision for the tax system appears clear. He has refused to endorse the recommendations of the Simpson-Bowles Commission, which would also have lowered statutory tax rates and broadened the tax base. Instead, his near-singular focus has been to raise statutory tax rates for high-income households and to leave untouched hundreds of special tax breaks for various political constituencies. A group of Tea Party activists has spent the last several months getting public input (including an open website vote) on ways to cut the federal budget. They recently unveiled a draft version of their plan. It's quite ambitious. The group spends the first 9 pages of the document laying out the history of the project and the principles it was organized by. Then they dive into the specifics of the budget proposal. I like their methodology and I think it shows that the Tea Party is capable of generating serious proposals, that it's not a know-nothing, knee-jerk reactionary movement. Reduces total federal outlays by about 15 percent in the first year. This may sound like a deep cut, until we recall that spending went up by 19 percent in 2009. Shrinks the government by 30 percent, relative to current law. Outlays shrink from today’s 24 percent of GDP to a more affordable 16 percent of GDP. Reduces gross debt from 99 percent of GDP to 75 percent of GDP. Reduces the publicly held portion of the debt from 68 percent of GDP to 47 percent of GDP. Reducing the debt is extremely important, because it’s the key to ensuring lower future interest rates and more robust economic growth. Warning: the link goes to a PDF file.